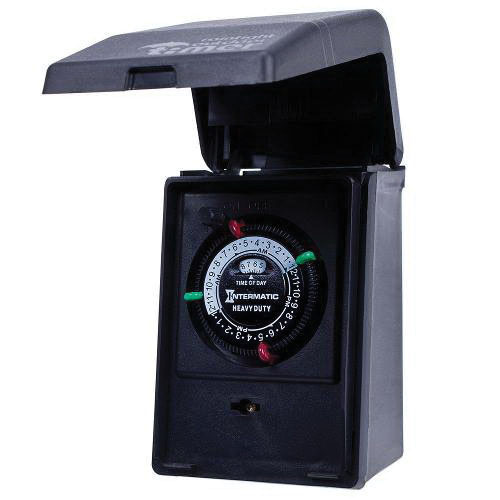 Intermatic Grounded mechanical plug-in timer in black color, is suitable for pumps, water fountains, aerators, landscape/holiday lighting and engine block heaters. The ON/OFF action timer has built-in enclosure. It has a voltage rating of 120-Volts AC, current rating of 15-Amps and frequency rating of 60-Hz. It has 30-min minimum timing range and 23-1/2-Hour maximum timing range. The plastic timer has a contact rating of 15-Amps at 120-Volts AC 1800-Watts (resistive or tungsten) and 1 hp at 120-Volts AC (motor load). It measures 3-5/8-Inch x 3-1/4-Inch x 5-5/8-Inch. The plug-in timer is CSA certified.